Scout is now officially on the hard! Captain’s Cove in Bridgeport pulled her out 2 weeks ago on a hide tide and moved her to new spot for the next 10 months or so. She is in good company, a gorgeous boat “Delphis” which has been a work in progress over the past 5 years, as well as other boats that being worked on. Most of Scout’s belongings have been painstakingly carried down the ladder, loaded into our remaining car and then piled into the basement. You would truly be amazed as to how much stuff was on our 38 foot boat. The basement is very full at this point with the gear of Scout, with a few more things to come off. Yesterday we even removed all drawers and cabinet doors. Brian has come up with some really great space saving ideas on how she will be rebuilt for our travels. He is also very close to figuring out how the rudder comes off. We have found a marine carpenter who will build us a new one, but wanted nothing to do with the removal or replacement of it. 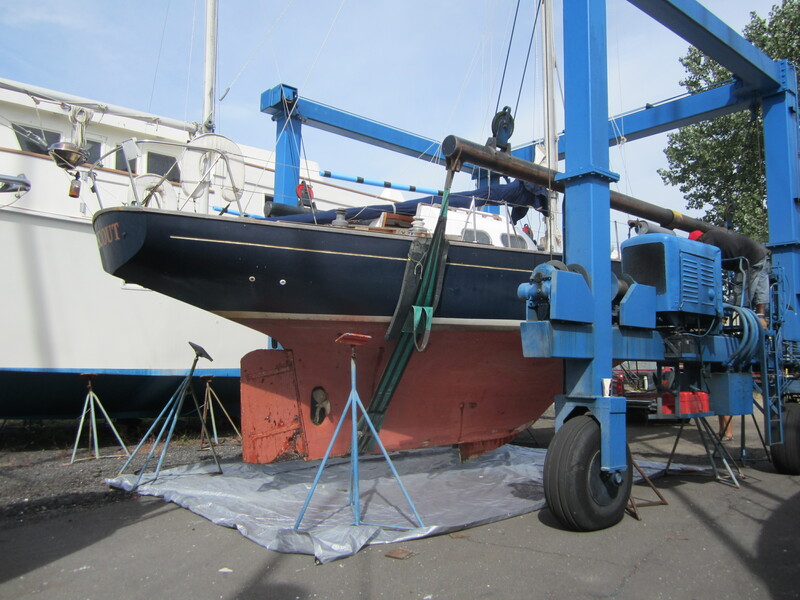 Brian has informed me that the rudder will come of the same day the crane comes to pull the mast and the engine. The only way the rudder will come off is if the crane lifts the stern of the boat to finally release the rudder. The whole refit project has had a delay added to it because Brian won’t be finished his job on September 30th like originally planned but October 31st. Let’s home the fall stormy weather holds off on all weekends so work can continue and get us to our 2014 sailing date. « A little work, a lot of fun!